Your smile is the way you greet the world. While you have many options for whitening your teeth, your dental professional is your best resource for whitening treatments. Only dental professionals have access to the most effective, professional-strength whitening solutions and can help ensure your treatment is safe. At Caboolture Dental Group we can offer two options for safe & effective teeth whitening. Teeth can be bleached with a professional at home bleaching kit. Your dentist will take impressions of your teeth so individually custom made trays can be constructed. These trays will be used to hold the bleaching solution close to your teeth. At home bleaching generally takes about two weeks for optimum results. 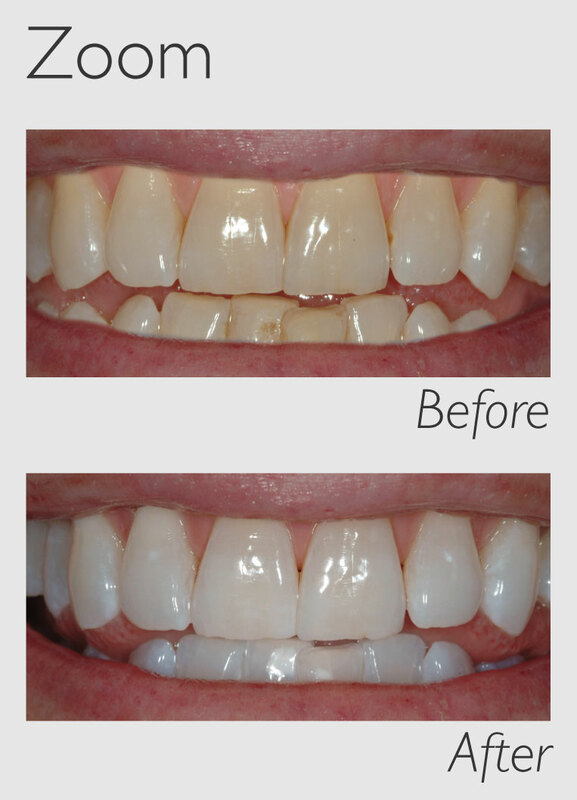 For busy people Chair side whitening in one visit (Zoom) can be a great option. This can also be discussed with your dentist. No professional whitening brand is requested by more patients than Philips Zoom. ** Dental professionals have trusted Zoom’s advanced technology and superior results backed by robust clinical evidence for more than 20 years. Whitening treatments help to reduce existing stains, but through consumption of coffee and soft drinks or just through natural aging, your teeth may eventually become discoloured again. Maintenance whitening can help combat recurring discolouration. Philips Zoomoffers a variety of whitening options to help maintain your white smile. There are many causes of tooth discolouration. Some of the most common include the consumption of highly coloured foods and drinks (berries, coffee, tea, red wine). Some medications, aging, smoking and trauma can also cause teeth discolouration.